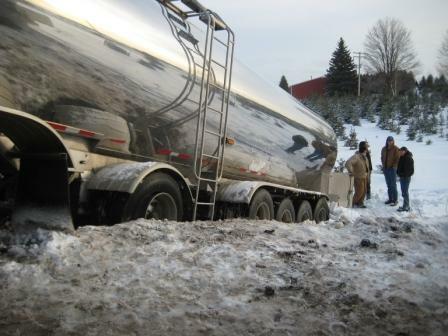 Chris Hubble was headed up an icy hill on Essex Road on Monday morning, headed to Dave Ritsema’s dairy farm for his regular pickup, when the milk hauler he was driving began to slide backward. He could feel 62,000 pounds of milk sloshing in the trailer. “When it gets to that point,” he said, “it goes where it wants to go.” The rig jack-knifed and came to rest with the tractor on the shoulder and the trailer angled down an embankment, wheels buried to the axles. Hubble Milk Hauling is a fourth-generation family business, so before the rocking stopped, Chris was on his cellphone to his father. Jeff Hubble took a moment to feel thankful no one was injured, called the dairy farms where pickup was going to be a little late, borrowed a tanker and headed north. Meanwhile Chris was watching a crew from Ward Eaton Towing try to wrestle his rig back onto the road. After an hour and a half, they’d shifted the tractor around some but the trailer was settled deeper. Chris stopped the work, concerned that continuing might damage the tank. They would have to lighten the load. The tow trucks left to pull more Antrim County drivers out of ditches, promising to come back as soon as the trailer was empty. Walt Wojan from Boss Dairy Farms arrived on a tractor, pulling a generator that could power the pump on the disabled rig. It took the rest of the afternoon – 62,000 pounds of milk is over 7,200 gallons – but by 6:00 pm the Hubbles had transferred the milk into the borrowed tanker, and Chris Hubble drove it away to finish his route. His dad stayed to supervise the extrication. The tow truck team was back and determined. The Banks Township Fire Department closed Essex Road to traffic and aimed high-powered light towers on the scene as it grew dark. Firefighters climbed down the bank to help maneuver chains and towlines. (“They’re a great bunch of guys,” Jeff Hubble said.) The tow truck drivers adjusted their cables, made a little progress here, hooked them up a different way, made a little progress there – and finally, at 7:36 pm, the tractor and trailer were both back on Essex Road and facing in the same direction. Hubble was elated. The rig was drivable, and the damage didn’t look too bad. Just another day at work in northern Michigan.